I'm still in the cave feverishly working on revisions for Boundless, but I wanted to stick my head out for five minutes to tell you that I have a new and improved blog / website. The biggest additions are the left-hand sidebar, where I have the foreign covers of my books linked to the publishers' websites. At the bottom are countries where the rights are sold, but no book has been published yet. I think. And I've moved the right-hand sidebar up to my fancy new events tab. I will be there with bells. Also, for those of you who haven't seen it on my Facebook/Twitter feed, I thought I would toss you a crumb. 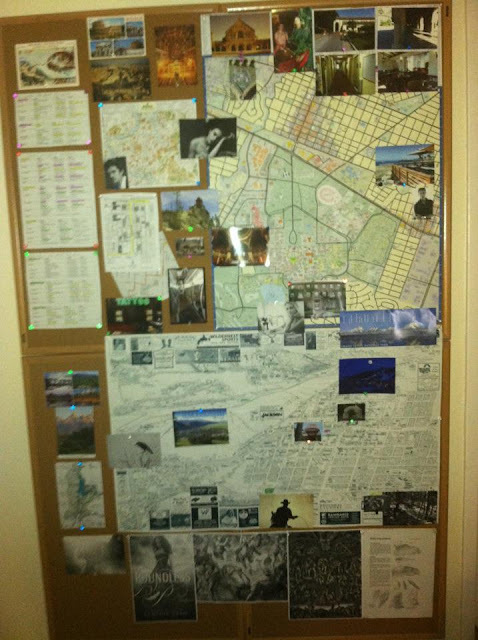 Below is a picture of my research board for Boundless. There's a lot of stuff on there you won't understand, some clues, perhaps. Closer to the release I will be sure to make a video where I walk you through the board and all its many wonderful parts.